I took Sofia first, then Rusty to turn out, on purpose, feeling ready to deal with Rusty's emotions. (Before I had taken them both at the same time and was not as able to keep track of how they were doing with both in hand.) I let Sofia go before I got a full change of thought. Rusty did well but I'd like to get a change of thought so that his worried look is gone. Small circles correct will help the bigger circles. Many times you have to do the extreme to get it clear for the horse. Rusty yesterday afternoon: bringing his life up = bringing the worries to surface versus they are a bit hidden (to me!) when he's duller? Rusty -- studdish -- would've taken Belle out if he could yesterday. Taking Sofia's halter off -- I might do other stuff to get her mind with me and feeling better. If it's a project or argument about the halter coming off, then you've missed dealing with their feeling bad already. When you start to see your horse feel worried, just do something about it now. Yes, Rusty has a worried spot in him that we haven't gotten to yet, but I'm better at helping when the surface worries come up. 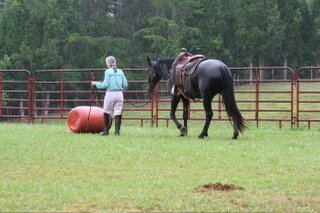 Time spent in round pen getting horse to make a choice to be with you is important. It helps with catching a horse. Morning ride: "Do it now" -- my motto for taking care of getting mind with me when it shows up that horse's mind is elsewhere. Harry says I will go back and forth between worrying Rusty and not, because what it may take to get his attention might well worry him. Ride today: working on getting off the left shoulder at trot (and walk) and releasing for long low neck. Also went over near bicycle and helped him get more confident there, then got four feet on teeter totter. Harry's sense of the biggest thing that happened this week was under the tent. You can talk and talk and talk, do and do and do, get good at all kinds of mechanical stuff but still don't get to the inside of a horse. How do you get someone to pick up the reins and put your leg on and get a feel? How do you teach this to someone? How to teach someone to feel the inside of the horse? How can you put leg on and pick up on reins and get a feel for the horse and change how the horse feels? Can you change how he is feeling? How can you effect a change in how the horse is feeling? Horse is all over the place without even going anywhere, so fix it so he feeling right inside before even walking off. A's question: is Diva OK or is she learning to shut down and DWI (Deal With It)? Harry: Diva is OK.
R: we get so used to our horse being not OK that it feels wrong when the horse gets OK.
Is this a horse thing as well as a human thing? The good feeling when I can offer my initiative and it's valuable? You have got to get each piece then put the pieces together. Like R working on just going forward. Then at some point R will work on using reins for softness, then they'll go together unless either piece isn't working then work on either piece. Might put them together at trot first. You can ruin your walk if you start with trying a collected walk. You don't have the impulsion. In most areas, if you don't get it good at the walk you'll not get it good at trot or canter. Softness and forward are always separate issues. Jigsaw puzzle analogy so find the spot that is missing. Ride a few finished horses and start a dozen colts before you own a horse. It doesn't take a lot of strength when it's right. Horse proves he knows what we want when they put a lot of energy into not doing it. Difference between disobedience and what horse thinks is best for himself. It's about that horse. "Disobedience" is about human's perspective. Horse is taking care of himself. Not disobedience but instead it looks like the best deal to do that action. Example: Bo steps away when K goes to mount. Both have to make stepping away a difficult choice, but also see that the riding experience is better so he doesn't mind carrying, even so he enjoys the riding experience. It is not "evasive" -- it's about the filly having a plan and her efforts to make that plan come through. "Evasion" is about the human. They need to understand how to look to us, how to fit in to our world. It's our responsibility to show them how to fit in our world. Listen to the mustn'ts, child. Listen to the don'ts. Listen to the impossibles, the won'ts. Sofia in round pen this afternoon. Does she understand intention? When I was thinking "send your thought out there" she responded better than when I thought "move!" Or was it just that I was coasting on what Harry had done with her? Increase or decrease my foot stride as I ask and if no response, then do something now about it -- don't leave them unclear!! Sofia's thoughts are still behind her but her feet scurry forward. Harry was able to send her mind ahead effectively! Sofia needs more exposure to strange things and movements, human and otherwise. My question re intention and Sofia. I was working at getting the physical done, and not focused on getting inside the horse and changing their thoughts. Recognizing that Harry got something different with Sofia than what I got. Harry's mental attitude that "there is no question this is going to work out." Instead of looking for a physical shape, look for the moments of mental availability and responsiveness. (I'm going to repeat this.) Instead of looking for a physical shape, look for the moments of mental availability and responsiveness. He asks her to try -- she said she's worried. He said he know but try and she tries and he knows it and stops asking. How does this mental part interface with developing a good ride? It's an ongoing thing for Harry, being aware of how an animal feels inside. Empathy -- my word to describe it. How can you be around another living entity and not know how it feels inside? If something is worth doing, it's worth doing poorly. Harry pondering, where did this come from? His degree of fear around horses as a child developed his empathy for the amount of fear the horse has. A: differences between shut her down and help her feel OK.
Summary: keep searching, keep floundering around and making mistakes. It's not going to come out right. 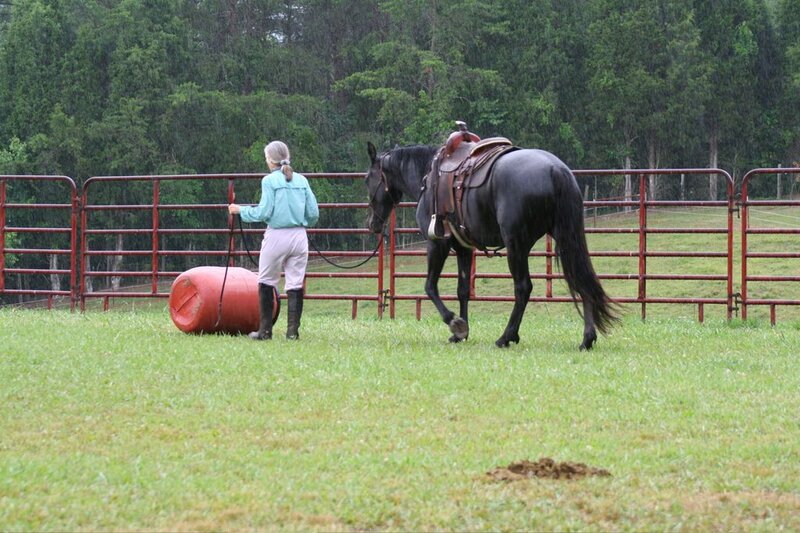 Your horse is going to forgive you and hopefully you're going to remember what happened before, and learn from it.